Greys of Ely, one of the leading coach hire operators in East Anglia, say they have ‘raised the compliance bar’ since switching to TruTac for their tachograph analysis and compliance-control software. 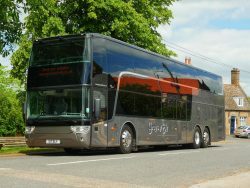 With over 30 modern coaches in the fleet, including their latest acquisition, an 83-seat luxury double-decker, Greys of Ely provide a wide range of services and contract work for virtually any occasion or requirement. This includes excursions and day-trips from the Witchford, Ely and Newmarket areas to popular destinations throughout the UK. TruTac, the compliance experts, provide Greys of Ely, CPT TachoAnalysis, TruTime and TruLinks API – industry-proven software modules to deliver complete compliance control. The combined systems seamlessly manage digital and analogue tachograph analysis; driver monitoring and debriefing, infringements and working time; online compliance reporting, document storage and several web-based, fully automated tools to ensure tight control across the operation. Furthermore, TruTime keeps a close eye on WTD (Working Time Directive) stipulations and for example, monitors and records everyone’s clocking-in time and start time to make sure that the permitted 15-minute interlude is not exceeded. In keeping with the company’s high standards, Greys of Ely is one of the few coach hire businesses in the UK to be accredited as a Coach Marque Operator. This prestigious quality-standard award is given only to those coach operators who adhere to a strict set of criteria and are regularly assessed by an independent third party to ensure compliance with the highest standards of operation.